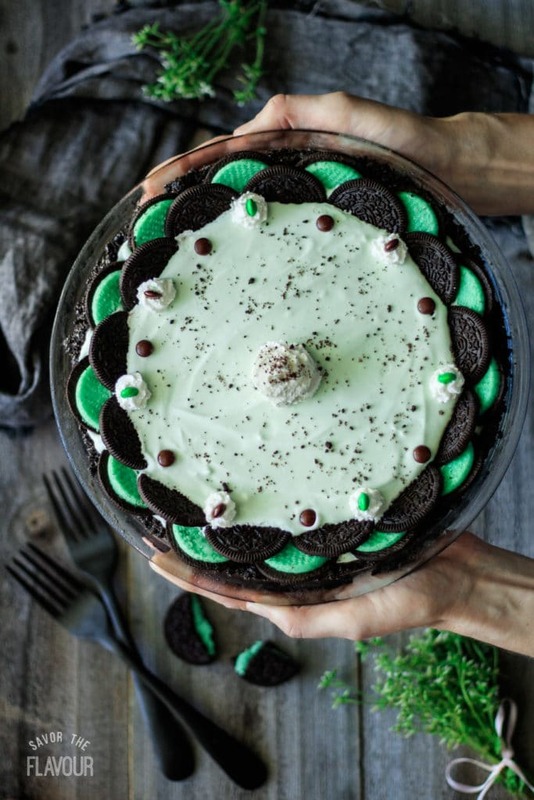 This super easy recipe for no bake frozen grasshopper pie is made with an Oreo crust, cream cheese, sweetened condensed milk, and other yummy ingredients. This St. Patrick’s Day mint treat is sure to become a family favorite! This no bake frozen grasshopper pie has been our family-favorite St. Patrick’s Day dessert for a few years now! It’s super easy to make, and only takes a few ingredients. In 30 minutes, you’ll have this delicious pie ready to go into the freezer. 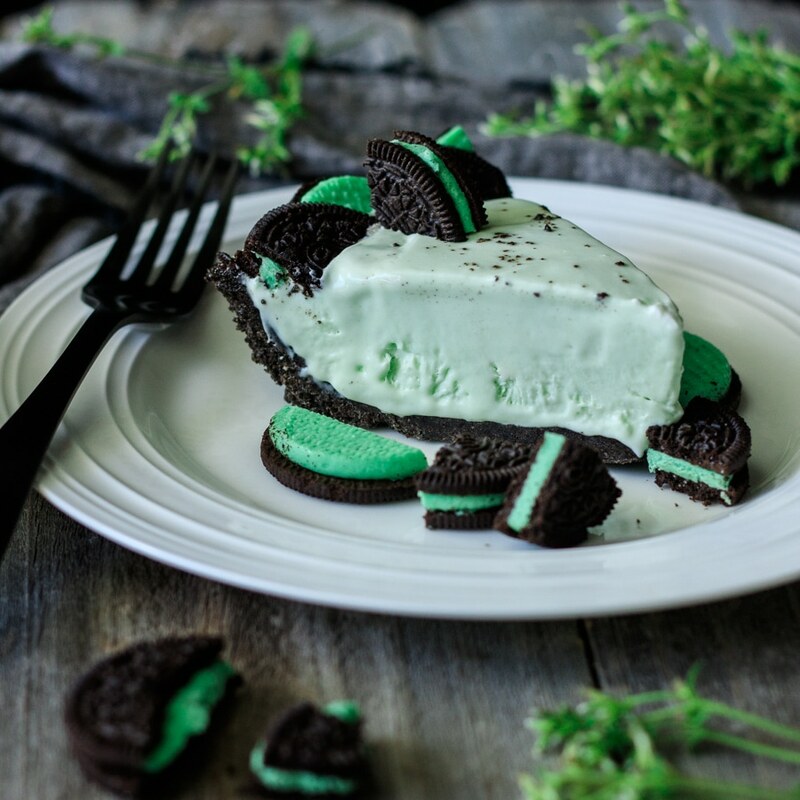 If you love mint and Oreos, you need to make this epic pie. Your family and friends will want this more than once a year! Hungry for more? Check out these delicious recipes. In the bowl of a stand mixer, beat the cream cheese until smooth, then scrape down the sides and beat in the sweetened condensed milk until well blended. Add the peppermint extract and enough green food coloring to color it mint green. Keep in mind that the color will lighten when the whipped cream is folded into the mixture. Whip the whipping cream until it is quite firm, but not dry. Fold the cream into the peppermint mixture until it is well mixed, then pour into the Oreo crust and smooth the top. Take the top cookie off of each Oreo, then slice all the tops and bottoms in half to get 14 mint halves and 14 plain halves. Arrange the Oreo halves around the edge of the pie in a decorative pattern. 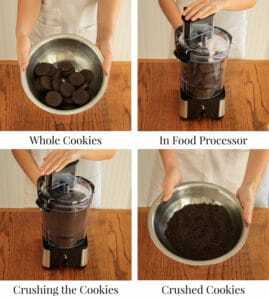 Crush any extra Oreos to make cookie crumbs. Whip the cream until it holds stiff peaks, then pipe it on the pie to decorate. Add mini M&Ms and Oreo crumbs if desired. Freeze for at least 20 hours before serving. If the pie is hard to slice, let it sit on the counter for 5-10 minutes and use a hot, dry knife to slice it. 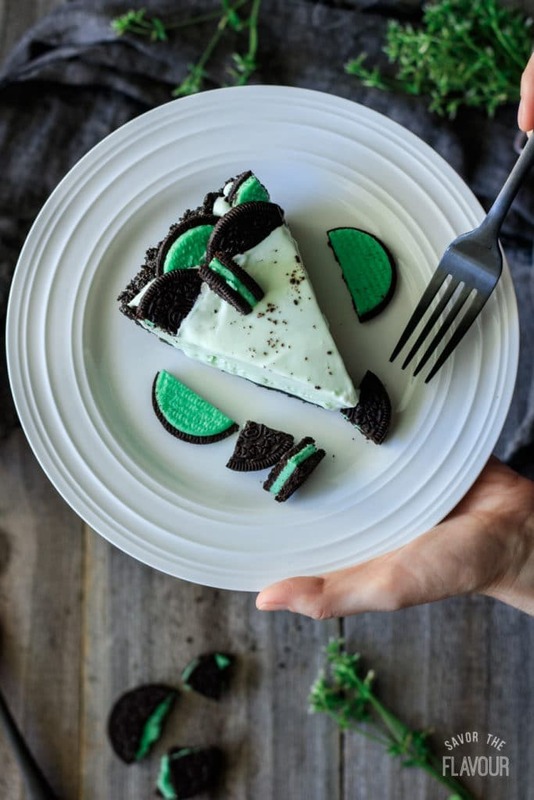 To increase the mint flavor, use mint Oreos in the homemade Oreo crust instead of the regular ones. Make sure they’re not the Double Stuf or thin ones, though! Glass pie plates work well for homemade Oreo crusts. Serve the pie frozen and store the leftovers in the freezer. If you must keep the pie out of the freezer for a long time, put the pie dish in a larger dish filled with ice to help keep it cold. This pie was delicious and turned out great! An excellent recipe!! That’s wonderful, Libby! I’m glad it was a tasty success for you.